Contents and Media: 453 dark grey plastic parts; 24 parts in clear; self-adhesive masks; two photo-etched frets (one coloured); markings for six aircraft. Fabulous detail; beautifully restrained and consistent surface detail; plenty of optional parts and ordnance; important subject. Same fuselage as MF kit. With their ongoing 1:48 scale MiG-21 family, Eduard continues to prove itself one of the most exciting model companies of the 21st century. 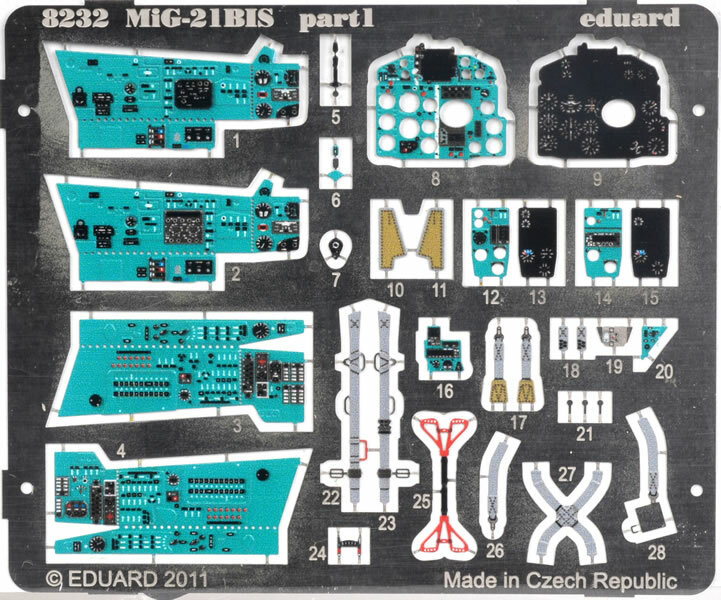 It seems like yesterday that Eduard's initial 1/48 scale Fishbed kit, the MiG-21MF, was released. In fact, it was back in March. 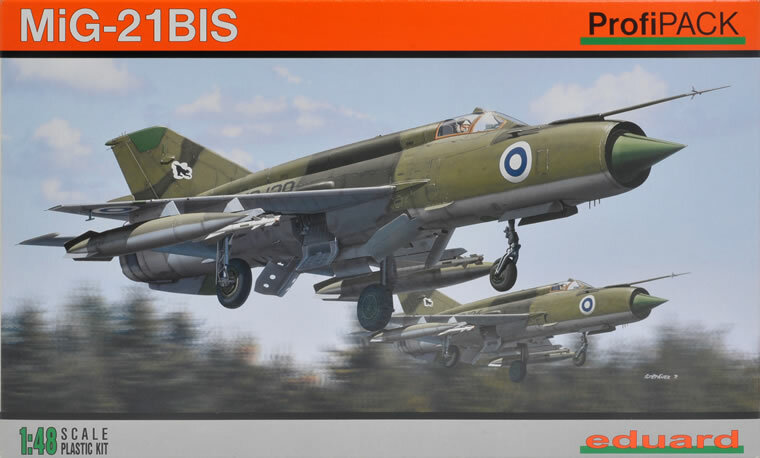 Now in December, hot off the moulding press, we have the 1/48 scale Eduard MiG-21BIS. The MiG-21BIS was optimised as a fighter, and was not intended to perform the ground attack role although it was still capable of carrying a large variety of bombs and missiles. The MiG-21BIS was widely exported to Warsaw Pact and aligned countries in Africa, Asia and the Middle East. It was also employed in the Soviet VVS and PVO. 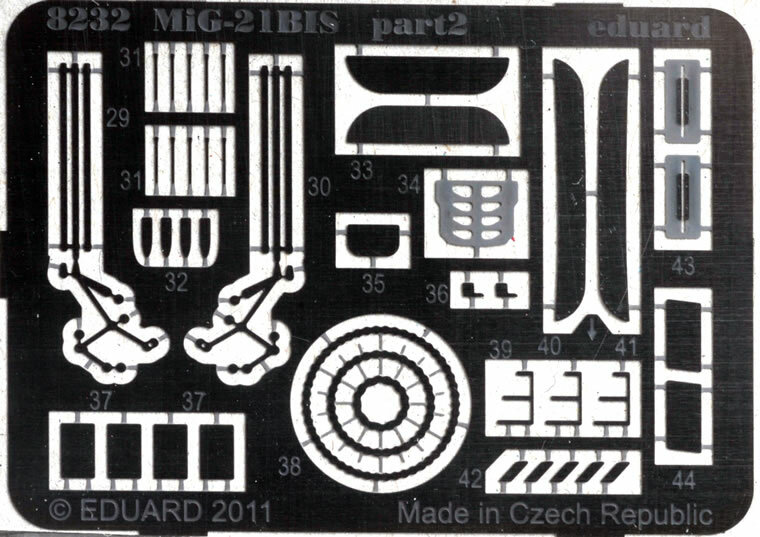 Eduard's latest iteration from the Fishbed family is a 1/48 scale MiG-21BIS. 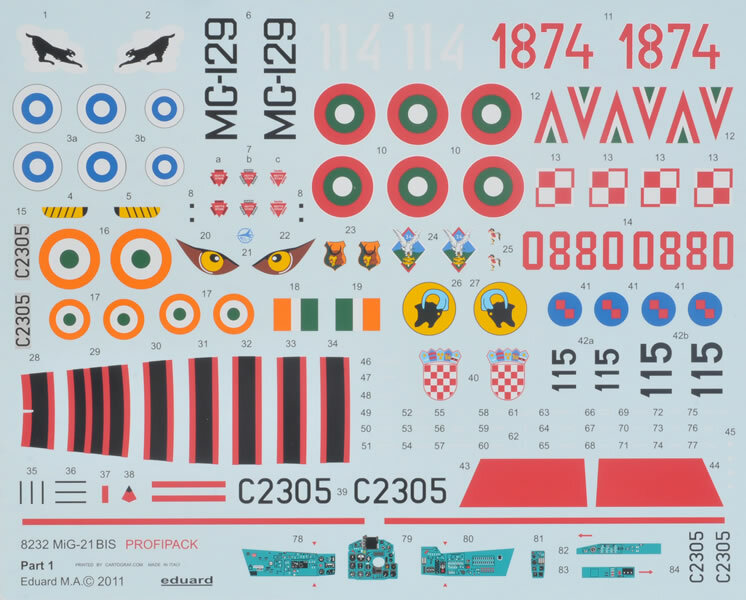 The kit comprises a whopping 453 parts in dark grey plastic; 24 parts in clear; self-adhesive masks; two photo-etched frets (one coloured); and markings for six aircraft. 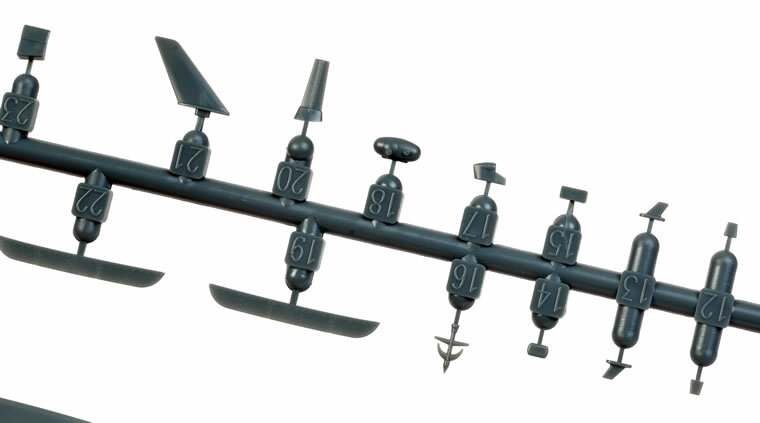 Of the nine plastic sprues, eight are common to the initial MiG-21MF release. For a detailed analysis of these parts plus photographs, please follow this link to view Jennings Heilig's excellent in-box review. 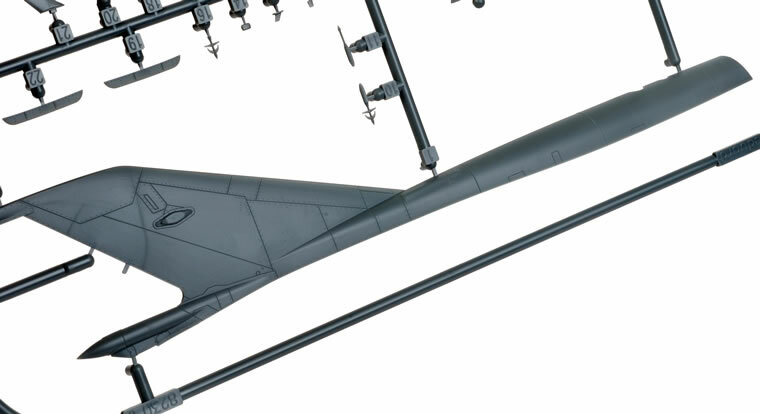 The new grey sprue contains the unique MiG-21BIS spine and fin, a shallower intake ring plus other characteristic avionic details for this variant. The two new photo-etched frets are also specific to the MiG-21BIS. On Spue A, the fuselage halves from the MiG-21MF are used for this kit although there are some subtle differences in nose contours between the two variants. Otherwise, the MiG-21BIS meets the same exemplary standards as its predecessors. The surface detail is restrained and crisp, detail is fantastic - I particularly like the use of the colour photo-etched parts in the cockpit - and engineering is world-class. The inclusion of self-adhesive canopy masks is always a nice touch. All of the plastic ordnance supplied in the MF kit are also provided with the BIS, so you will have a big bonus for your spares box too. Six varied and colourful marking options for export examples are provided. The main decal sheet is beautifully printed by Cartograf. The decals are glossy, colour saturation looks excellent and carrier film is thin. It appears that the stencil data sheet has been printed in the Czech Republic either by or for Eduard. Once again, the quality of these looks excellent - glossy and readable under strong magnification for even the smallest markings (assuming you can read Russian, that is). MiG-21BIS, Izdelye 75A, 31st Fighter Squadron, Kuopio airbase, Finland, 1980 - 1981. Finished (or should that be Finnished?) in Olive Green and Black upper surfaces with Light Grey below. MiG-21BIS D, Izdelye 75A, 22nd Fighter Squadron, Pula airbase, Croatia, 2008. Three toned green and grey upper surfaces with Light Blue lowers. MiG-21BIS, Izdelye 75B, 3rd Air Base, Graf Ignatievo, Bulgaria, from 2002. Another wild three-tone upper-surface scheme. MiG-21BIS, 1st Air Division of Polish Navy, late 90´s, Gdynia – Babie Doly airbase, Poland. Overall bare metal. MiG-21BIS, Tactics & Air Combat Development Establishment, Jamnagar airbase, India, September, 1986. Light Grey overall with a black fin (with a red stripe), and red and black stripes on the spine. I recall building Eduard’s first full model kit, a 1:48 scale Siemens-Schuckert D.III, not long after it was released in 1993. This was a genuine warts-and-all limited run offering with thick plastic, lots of flash, no assembly aids such as locating pins or tabs and an interior entirely made up from photo-etched parts. It was a tough build to be sure, and quite crude by today’s standards, but I was delighted by the choice of subject and the innovative use of multimedia. Only 500 of these kits were manufactured, and thanks to one of HyperScale's generous visitors I still have one stashed away to build again one day. Fast-forward 18 years and I continue to be delighted by Eduard’s choice of subjects, but building their kits is a very different experience. 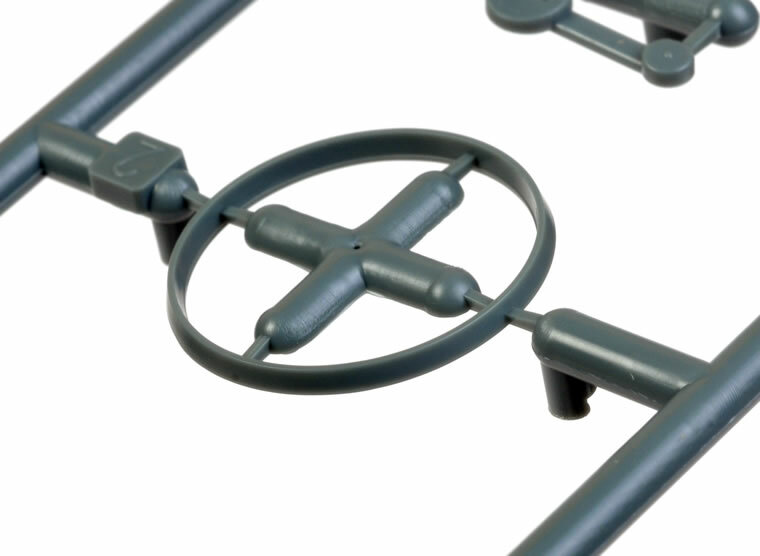 The quality of Eduard’s plastic rapidly improved, making a particularly big step forward with the introduction of metal moulds. Eduard has established themselves as a market leader in the field of 1:48 scale WWI aircraft, and are snapping at the heels of Japanese model companies in terms of level of detail and fine surface texture. Eduard has introduced a number of innovations over the years including the use of photo-etched parts, the inclusion of masks, the introduction of colour photo-etch, self-adhesive photo-etched parts and now the occasional resin part thrown into kit packages for good measure. There are still a few clues to pointing to Eduard’s roots in their new 1:48 scale MiG-21 family (such as the flat-pack wheel well breakdown), but building these kits is a very enjoyable experience. Based on my experience of building the debut MiG-21MF releaase, fit should be excellent throughout. The MiG-21MF had the most precise assembly feel of any Eduard kit I have built so far - there was not a single “whammy” area to look out for. The surface detail is as good as I have seen from any manufacturer. Detail in the cockpit, wheel wells and afterburner is terrific. The use of multimedia parts, and in particular the colour photo-etch, is appropriate and adds an impressive air of authenticity that would be impossible for most modellers (myself included) to match with brush and paint. I am looking forward to seeing where they go from here.